West Virginia truck driver, Russell Evans, has filed a lawsuit against Range Resources for failing to act after he had direct contact with frack water. In fact, the company told him the water was harmless and actually refused to let Evans leave the job site for the few hours it would take to get medical attention. According to the complaint, Russell Evans had been stopped at a “sloppy bond”, (which is used to store reused frack water) and he noticed that his truck was leaking. Evans said that during his attempt to stop the leak he was doused by frack water and immediately notified a Range Resources employee about the incident, explaining that he needed medical attention. However, Evans alleges that the company employee from refused to let him leave the job site for two hours and assured him that the water would not harm him. George M. Kontos is the attorney representing Evans and says that his client stands firm by the allegations listed in the lawsuit. “We certainly want to do all that we can to ensure that Range is held responsible for its actions in this case, and for misleading our client and the public about the harmful nature of this water,” Kontos explains. 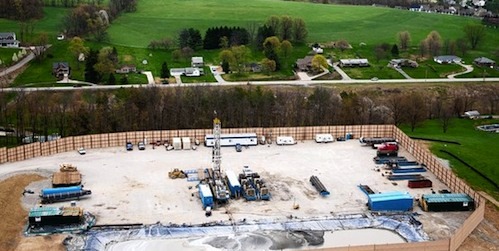 A spokesperson for Range Resources insisted that the company disclosed all materials in frack water as required by law. “There are no secrets, especially when it comes to safety. Range’s commitment to safety is shared by the nearly 900 men and women who work here and it’s ingrained in our culture. The single most important thing for us is making sure that every worker goes home safe at the end of their workday,” said Matt Pitzarella in a statement. However, in 2013, Range Resources did admit to a judge in a Pennsylvania case that the company did not know the contents of its frack water. Fracking in general has been linked to a wide spectrum of health problems for Americans across the country. "There are a tremendous number of poorly understood and potentially serious health risks associated with fracking, one of which is exposure to radioactivity," says Aaron Bernstein, a pediatrician and associate director of the Center for Health and the Global Environment at the Harvard H.T. Chan School of Public Health. "We simply do not have anything close to adequate safeguards for people's health." Wow is my thoughts exactly. I wonder if it's got anything to do with union.